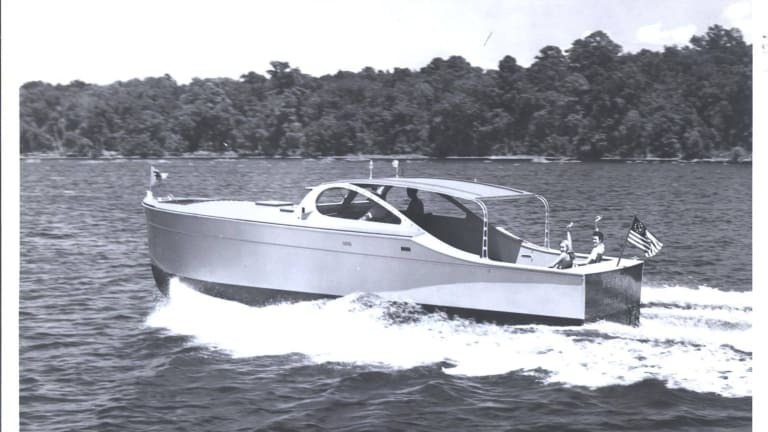 When you hear phrases like “dual hybrid propulsion” and “vacuum-infused urethane acrylate resin, Core-Cell and E-glass,” you’re probably not picturing a boat with art-deco styling, one that would look right at home in a black-and-white photo of a 1950s yacht club. 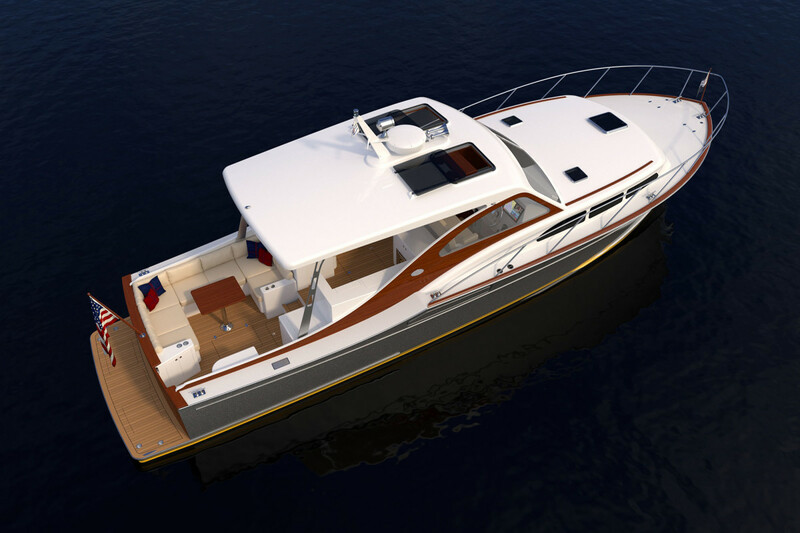 But those are just a few of the new ideas that fit seamlessly into the overall vision of the Hybrid Sportsman 38. Huckins yachts have strong DNA. 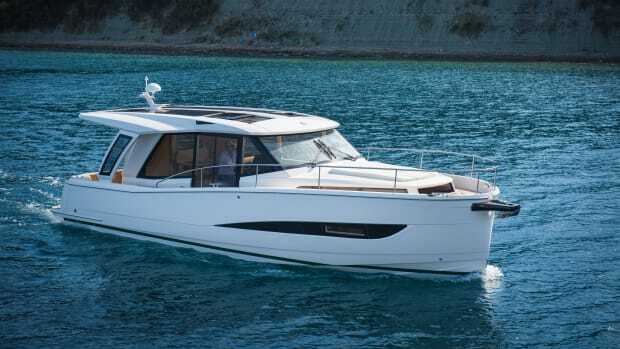 Though more than 80 years separate the two models, you’d be forgiven for momentarily confusing the new Huckins Sportsman 38 with its ancestor, the Huckins Sportsman 36 as it flies past you at 35 knots. Their shared pedigree goes well beyond those eye-catching stanchions. 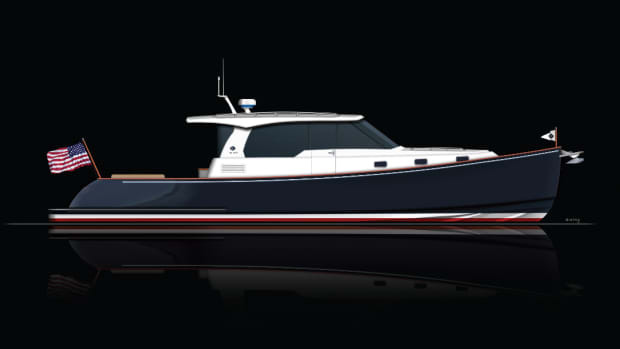 The new model is a direct descendant of the Huckins Sportsman 36, which was built by company’s founder, Frank Pembroke Huckins, in 1936. 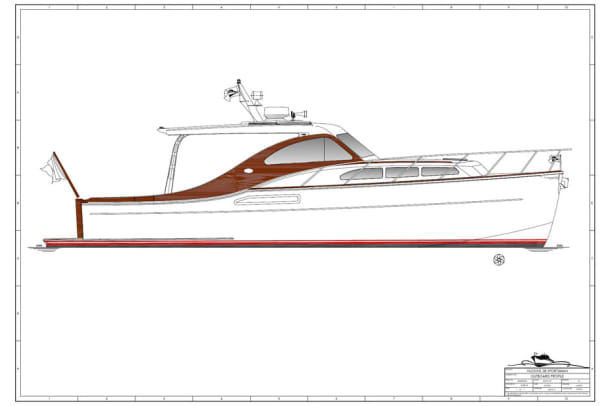 The 38 is built on Huckins’ iconic hull, a design that remains quite similar to the original hull of the Sportsman 36. 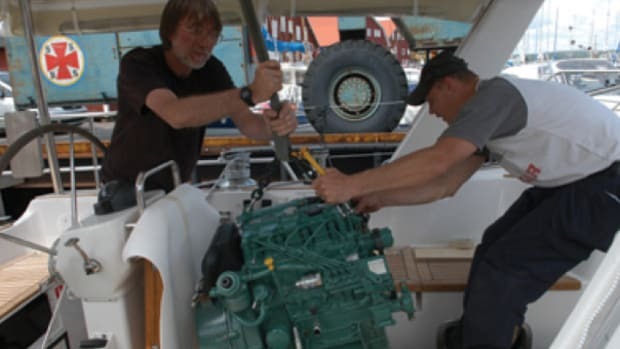 Introduced in 1928 as one of the first true planing hulls, the Quadraconic hull, as its name suggests, is based around four cones, with the concave sections working to reduce pounding. 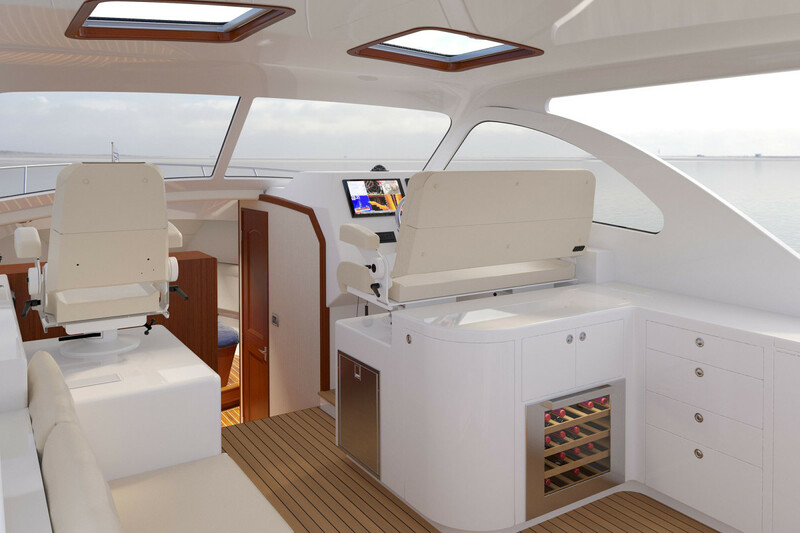 Huckins Yachts claims the hull greatly reduces wallowing, making their boats less easily knocked off the plane than competing models. Over the years, Huckins has worked to keep their founder’s hull design as more of a living legacy than a dust-collecting historical highlight. 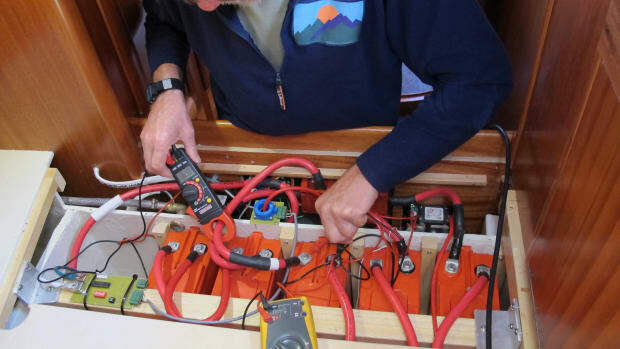 While the hull shape itself may not be new, the materials and techniques used to build the Quadraconic hull today are industry leading. Core-Cell M100 structural foam and E-glass combine for a lightweight composite construction that holds up, and a bottom skin made of a Kevlar and E-glass blend adds an extra layer of protection when pushing the limits of its 2-foot, 6-inch draft. 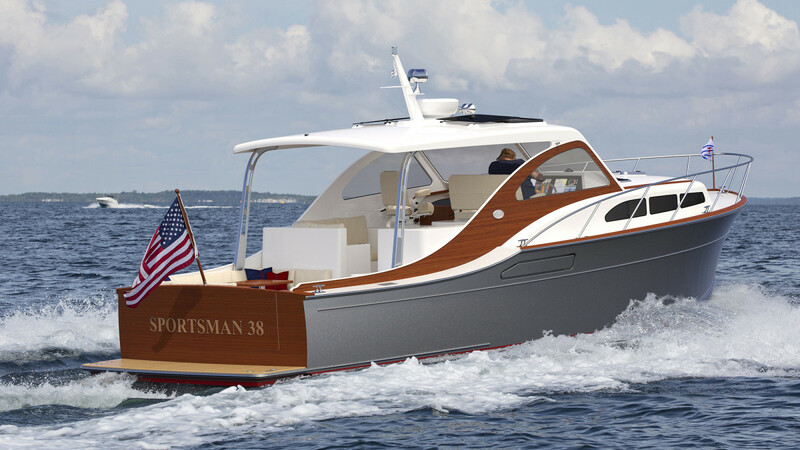 The distinctive design of the Huckins Sportsman 38 embraces the past while looking to the future. Historically known for its ability to get to plane at much lower speeds than competing models, the increased efficiency of this hull makes it the quickest to plane yet—the Sportsman 38 gets up on plane at 11 knots. 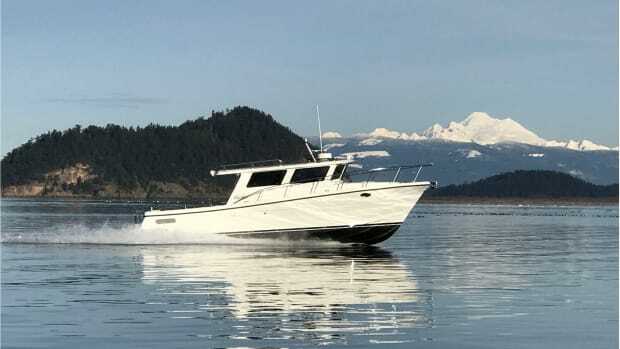 Huckins’ lightweight hulls are known for being relatively fuel-efficient, but the Hybrid Sportsman 38 takes this a step further with a hybrid power package, featuring twin 380-horsepower Cummins QSB 6.7s that can get you speeding along at 35-plus knots and a 20-horsepower Elco EP-20, which allows for a remarkably silent 7-knot cruise. 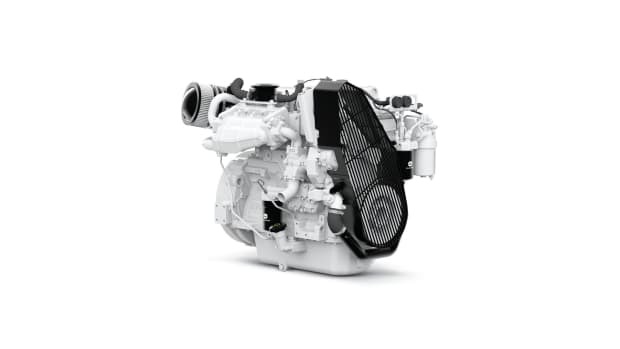 Shifting between the diesel and electric engines is billed as “seamless.” The flexibility it provides could change your whole cruising game. The diesels recharge the electric batteries, and the inverter can power the microwave, fridge and 110-volt outlets, eliminating the need to run a noisy genset at night. Both interior and exterior blend traditional elements with modern construction, emphasizing simplicity and ease of maintenance. The new model’s styling nails the vintage look down with the smallest details—even the stanchions used are reminiscent of the original 1930s Sportsman 36. But modern materials have made this high-quality aesthetic available to today’s owners with minimal hassle. “Mahogany panels on the superstructure are screwed into an inset in the fiberglass side and can easily be removed for varnish,” according to the builder. 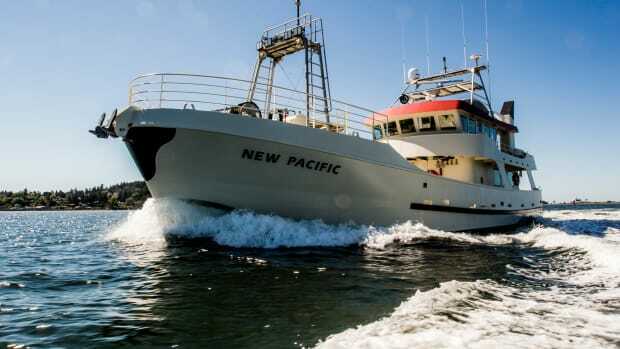 If that’s not a DIY boat owner’s dream come true, Huckins notes the panels could even be “replaced with fiberglass composite and painted with a poly paint” for further ease of maintenance. In 1936, a seagoing boat with a planing hull was revolutionary. And today a hybrid-powered recreational vessel, not to mention one with classic lines, is just the type of forward thinking that would, I assume, make Frank Huckins proud.